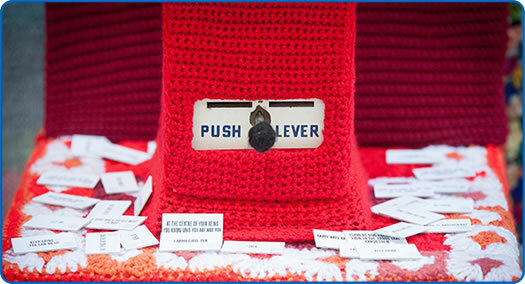 Ali created ‘The World’s First Knitted Wisdom Dispensing Machine’ for the Fresh Arts Festival in 2015. Through knitting in groups with patients and staff, she noticed that people would share encouraging words, wise sayings and empathy. These words then formed the basis of the machine – a crowd-sourced collection of wise words to give Southmead patients, visitors and staff a moment of emotional support. After the festival the machine moved into the main atrium of the hospital where it dispensed 3100 tickets of wisdom over 3 months. It became an unexpected ritual; patients came down from their wards to collect their daily wisdom, visitors stopped by on their way to the wards to pick up a ticket to share with a loved one, and staff on their way to start a shift. There were many special moments created by these collective experiences. “Filling up the ticket machine today, I met a mother and daughter who were visiting their father/husband who was very poorly on end of life care. They have come down to the machine a few times during his stay for a change of scene and something to distract them; they had come again to see if it had been filled up. As I finished the refill, we talked about the project and that the words that had come from patients and staff at the hospital. They each took a ticket – the daughter’s ticket said ‘you are stronger than you think’ and her mother’s said ‘tomorrow is another day’. They were both really touched by the words they received describing it as ‘just what they needed to hear’. Alongside the wisdom machine Ali and her team of knitters also created inspirational banners sharing some of the words of wisdom. These were installed in surprising and unexpected locations around Southmead in time for the Fresh Arts Festival.